- 25 Pounds of Organic Fair Trade Shea Butter from Mudfarm Organix. Always pure and unrefined straight from Ghana. Grade A Product that is always fresh and from the purest quality. Our suppliers are trusted Fair Trade Co-Operatives in Ghana. Use in your cosmetics or for personal use. Pure Shea Butter is the perfect all natural moisturizer for all skin types. Buy wholesale and save on 25 Lbs of Yellow Shea Butter. GRADE A Shea Butter. Always freshly imported from Ghana. This is the best site to buy 100% natural Shea Butter online and in North America. 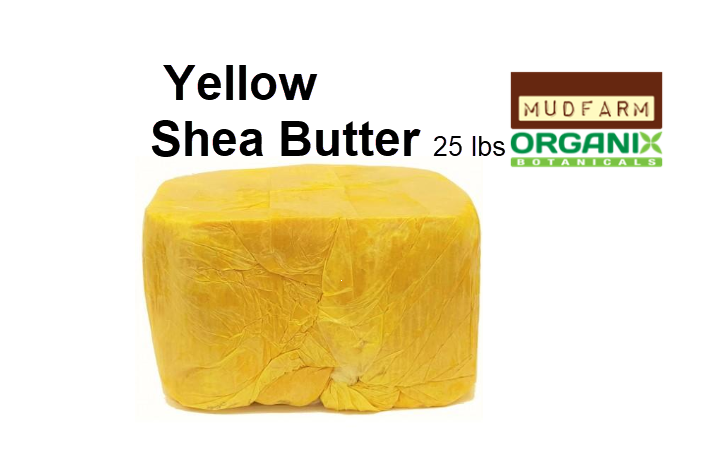 Click the button below to add the 25 Lbs Yellow Organic Shea Butter to your wish list.